The Los Angeles Times visited Bend, Ore., in June 1989 and chronicled the start of the Angels short-season Bucks' season. The Bucks shortstop, Brian Specyalski, recorded the team's first home hit of the season, The Times wrote. He did so as he broke his bat on a single to left. The Times didn't record who ran out to pick up that broken bat, but the person to retrieve it likely was either bat boy Matt Russell or bat boy Jason Lundgren. 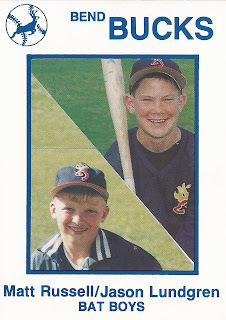 Both boys served as bat boys for the Bucks in 1989 and even got their own shared baseball card along side the likes of Specyalski and the other Angels prospects. The two appeared on that card side by side in Bucks warmup jackets. They both returned for 1990 and again got on their own card, though this time they were pictured separately, the photos put together. The 1990 card includes the team checklist on the back. The Bend Bucks bat boys only appear to have been included in those two sets, not in 1988 or in 1991.